significantly influenced by Near Eastern cultures. From a Western cultural viewpoint the representation of men reclining at banquet was a sign of decadence, also evidenced by the presence of what appeared to be courtesans. 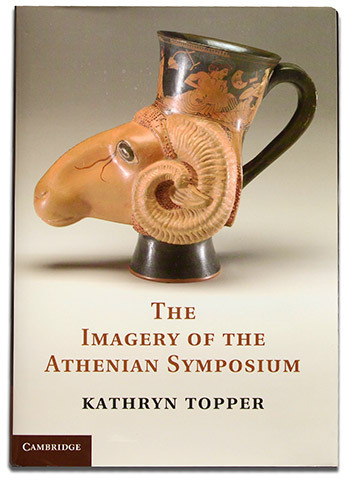 In her book, The Imagery of the Athenian Symposium, Professor Kathryn Topper asserts the Athenians believed that from their earliest days as cave dwellers, the Greeks had reclined to eat, that citizen women were included in banquets and that symposia were democratic celebrations, not exclusive events only for the elite. Professor Topper takes a new and unprecedented look at vase painting as an exploration about Greek society generally, not simply as a documentation of the depicted sympotic practice. She examines the ways the depictions on the vessels expand upon our knowledge of the history of Athens and, importantly, raises the larger question about the certitude of assumptions made on the basis of visual cues alone. Though sometimes coupled with text, the images of the book art featured here play a critical role in whatever assumptions viewers might make about the meanings of the books. The images may be ambiguous, politically provocative, metaphoric or even seemingly inscrutable, but they always encourage the viewer to question his or her first assumptions and search for new ways to approach the story.